. 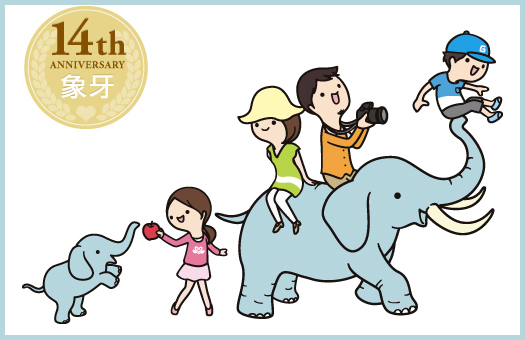 Netsuke 根付 miniatur sculptures .
. zoo 象 elephant, der Elefant . CLICK for more Daruma san from Ivory ! 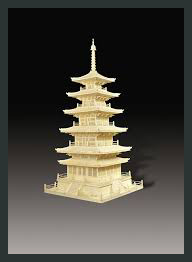 1 - When shaping a piece of Edo Zoge (ivory carving), after both the development of a plan and the application of carver’s ink, the shape is roughly carved by hand using tools including saws and chisels, etc. 2 - The traditional techniques used (for both the finishing and patterning of ivory pieces) include 線彫り line carving, あらし模様彫り rough-patterned carving, 布目模様彫り textured-patterned carving, 平彫り flat carving, 芝山彫り Shibayama carving (the use of inlays), and 透かし彫り open-work carving. ① はぎ合せは Matching and doweling techniques are used when carving stationary pieces. ② 撥（ばち） When working with ivory that has undergone bachiru coloring (a traditional coloring technique), jointing is done using a cementing agent. 4 - 磨き Polishing techniques use トクサ scouring rushes, the leaves of the ムクの葉 muku tree and 角の粉 angular powder, etc. 5 - The dyeing of colors into ivory involves the use of natural dyeing agents such as yashabushi (green alder), etc. 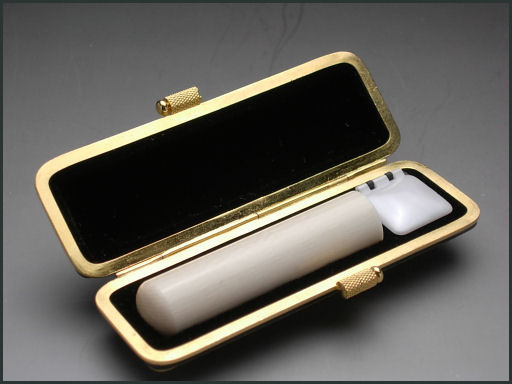 In that ivory possesses a smooth texture, beautiful luster, the subtleness of vein patterning and ideal hardness; it offers everything that is required of a superior material for traditional crafts. As such, since ancient times it has been highly-prized in both Eastern and Western cultures. In Ancient Egypt, ivory created opulent furniture and personal ornaments; in Ancient Greece and Rome, it was the material from which countless deity statues were fashioned. 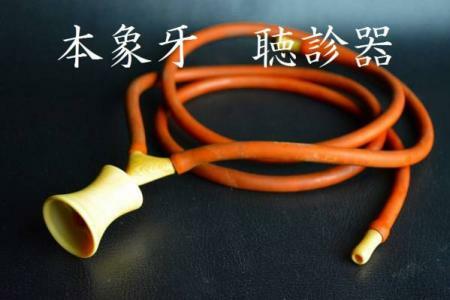 Ivory also has a rich usage tradition in China. 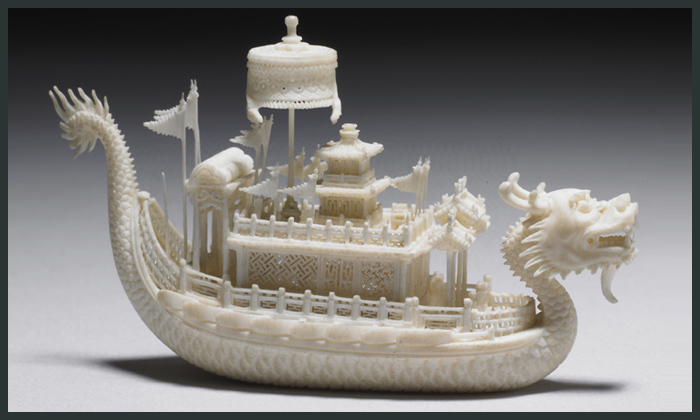 With large volumes imported by China from India and Thailand during the thriving commerce of the Sui and Tang Dynasties, ivory was a material that came to be loved by the ruling classes, it being employed by the Chinese to create decorative furniture among other forms. Based on ivory pieces held by the 正倉院 Shoso-in (the treasure house of the Todai-ji Temple in Nara Prefecture), it can be understood that Chinese carving techniques were conveyed to Japan during the Nara Period (710-794). Within the Shoso-in collection, there is a 儀礼用の物差し rule (a scepter) used in religious ceremonies that features intricate ivory carvings. There are also 琵琶の撥 Biwa (Japanese lute) plectrums, and stones for the 碁石 board game of go, etc., all of which have been fashioned from ivory. 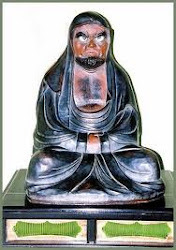 Furthermore, in that the Shoso-in also possesses samples of unprocessed ivory (in its natural state), it is possible to appreciate that processing and the creation of ivory pieces was also conducted in Japan in ancient times. To explain what ivory is, it represents the grown tusks of elephants, with large examples being three to four meters in length, and sometimes weighing between 40 to 60 kilograms. The tusks of female elephants tend to be narrow and long, while the tusks of males are both strong and thick. It is said that ivory product manufacture in Japan commenced with spoons and other accoutrements (such as container covers used in the tea ceremony). During the middle of the Edo Period (1603-1868), ivory pieces came to be widely used, with items such as netsuke, 髪飾 hair ornaments and 三味線撥 samisen plectrums, etc., coming into use. 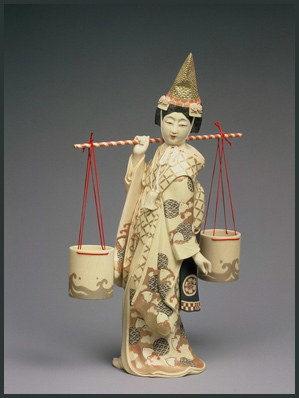 This resulted in ivory being loved by people of many different classes from the samurai to the townsfolk of Edo.
. Shiokumi 汐汲 "Salt Scooping Girl" .
. Reference : ivory japan . Once there was a thief in Matsubayashi. When he came to the house of Grandma, she looked for her 象牙のかんざし hairpin of ivory to chase him away, And he left fast. 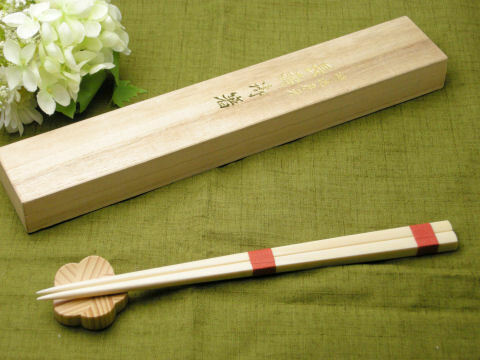 A hairpin from ivory is a powerful amulet to ward off evil.
. hashi, ohashi, o-hashi　お箸 chopsticks .